It’s really a pleasure installing an exhibition of an artist I admire and who held tightly to a set of academic and intellectual principles during her working life. Loïs Mailou Jones maintains a special position in the Washington, DC arts scene as an artist’s artist. She taught at Howard University for over four decades, influencing budding artists and developing a wide circle of supporters. Born in Boston, she had the advantages of sophisticated art schools and mentorships that encouraged her to become a professional. If I had to highlight any part of a “back” story, I would say that Jones was a master at navigating her way through challenges that might have thrown obstacles into her plans to become a professional or reduce the quality of her work–and therefore her reputation as an artist. As an African-American woman she was called on to represent her race at various times in her life, first as a recruit to establish an art department at Palmer Memorial Institute in Sedalia, NC. The Institute itself has a fascinating history, the brainchild of Dr. Charlotte Hawkins Brown and supported by a benefactor, a former president of Wellesley College, Alice Freeman Palmer. 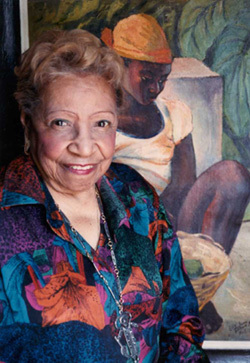 After moving to DC to teach at Howard, Jones’s art began to take flight from the strict Western European canon from which she was taught, to incorporate influences from Africa and the African diaspora art. The fascinating thing about Jones is that she consistently returns to her foundations in her work. She incorporates Haitian Voudou symbols and African masks, but always with an eye to composition, pattern, and beauty. Always involved in the fight against racism, she never fully gave over her art to become cause-based propaganda for any single movement. In this way, she maintained her trajectory to become established in the canon of American art history, someone to be reckoned with, an artist to be seen in great museums and purchased in galleries, not a nameless entity pushing along a political or social agenda. This entry was posted in From the Curator by Women in the arts. Bookmark the permalink. I love the idea of an artist describing life and culture by using symbols and masks in her artwork. The Italian Commedia Dell Arte also fascinates me.